The Arc de Triomphe will be wrapped in 25,000 square meters of silvery blue recyclable fabric and 7,000 meters of red rope. On April 6-19, 2020 Ambassade d'Art will take you there on a guided tour. ❤️ contact@ambassadedart.com to receive updates. Christo, in close collaboration with the Centre Pompidou and the Centre des monuments nationaux, will create a temporary artwork in Paris entitled L'Arc de Triomphe, Wrapped (Project for Paris, Place de l'Étoile – Charles de Gaulle). This artwork will be on view for 14 days, from Monday, April 6, to Sunday, April 19, 2020. The arch will be wrapped in 25,000 square meters of recyclable polypropylene fabric in silvery blue, and 7,000 meters of red rope. Its realization will coincide with a major exhibition at the Centre Georges Pompidou, from March 18 to June 15, 2020, retracing Christo and Jeanne-Claude's years in Paris from 1958 to 1964, as well as the story of The Pont-Neuf Wrapped, Project for Paris, 1975-85. "The exhibition at the Centre Pompidou will reveal the historical context of the period during which we lived and worked in Paris," says Christo. The Centre des monuments nationaux, the government institution that manages the Arc de Triomphe, is pleased about the realization of a project that demonstrates its commitment to contemporary creation and that honors one of the most emblematic monuments in Paris and in France. 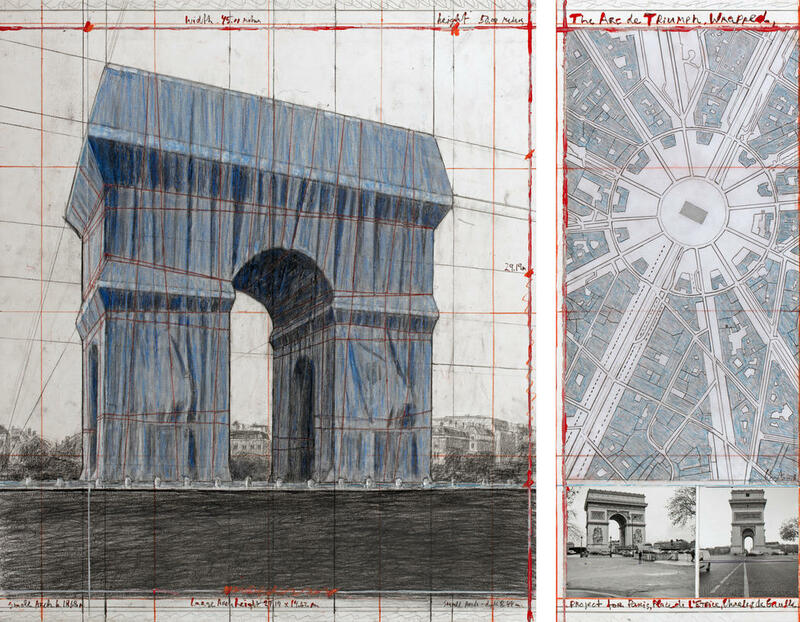 L'Arc de Triomphe, Wrapped will be entirely funded by Christo through the sale of his preparatory studies, drawings and collages of the project as well as scale models, works from the 1950s and 1960s and original lithographs on other subjects. It will receive no public or private funds. In 1961, three years after they met in Paris, Christo and Jeanne-Claude began creating works of art in public spaces. One of their projects was to wrap a public building. At the time, Christo, who was renting a small room near the Arc de Triomphe, made several studies of a project there, including, in 1962, a photomontage of the Arc de Triomphe wrapped, seen from the Avenue Foch. In the 1970s and 1980s, Christo created a few additional studies. Almost 60 years later, the project will finally be concretized. "Thirty-five years after Jeanne-Claude and I wrapped the Pont-Neuf, I am eager to work in Paris again to realize our project for the Arc de Triomphe," says Christo.